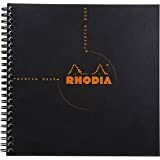 Rhodia Set of 5 Graph Reverse Standard Notebooks, Paper and Metal, Black, 8.25" x 8.25"
Maruman’s horizontal A4 sized idea notebook is perfect for mapping out ideas and drawing or sketching inspirations. 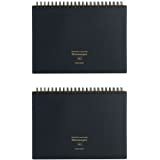 Well designed with professional mind, this notepad is also great to use as an executive notebook and a business notebook for gathering ideas and visualizing brainstorms at business meetings. This versatile writing pad features 70 micro perforated white papers with 5 mm x 5 mm light gray square grid while the back side is blank. It measures 210 mm x 297 mm after detached, exact same as A4 size sheet. Each page has a blank header with title and date/no. For easy organizing. 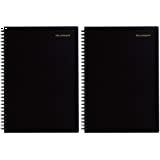 Firmly bound on top with quality Twin wire system that allows pages to completely lay flat. Perfect for both left and right handed writing. A small arrow on each side of double wire binding guides you to place your finger right above the perforation for clean and easy detach. You can remove the sheet when you want to scan the page, make copies, or to compare charts side by side. Durable Poly front cover will stand up to rigorous daily use and the extra rigid back hard cover provides additional support wherever you take note. Maruman’s premium quality, 80G/M2 acid free papers are made in Japan with their uncompromising commitment to its quality to promise a superior smooth writing with minimal ghosting and bleed-through. 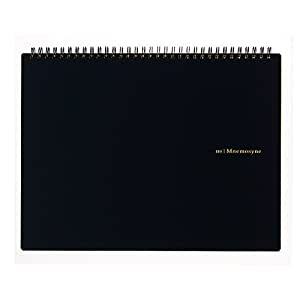 Mnemosyne, named after the Greek goddess of memory, comes in a variety of sizes and styles, which is ideal to use as executive journal, professional notebook, idea journal, day planner, weekly planner, task planner, and log book, etc. I have no idea why, but Japanese office/stationery products are infinitely better than their North American counterparts. The difference in quality is just palpable – they're visually appealing, built to last, and thoughtfully designed. 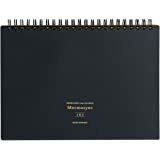 I prefer spiral notebooks to anything with a binding, and this particular one by Maruman quickly became my favorite. It's large without being cumbersome, and elegant enough to fit into a professional setting. The paper is creamy and smooth, and even my extremely fine tipped pens glide along like a dream, without a hint of scratchy resistance. I'm also a big fan of the page layout. The subtle gray lines keep your handwriting tidy, but they're virtually unnoticeable when you're scanning over a full page of notes. That's the kind of useful, simple design tweak that makes you go, "wait, why isn't the standard way to make this thing?" 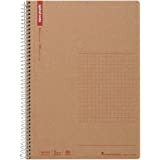 If you're trying to choose between similar notebooks, I highly recommend this one. I've had mine for a few months, and I'm investing in several more. 5.0 out of 5 starsLandscape orientation is a winner for lefties! Very unique item from Japan that popped up on my Amazon search for a medium sized notebook for work meetings that would be easy to use for a left-hander. I'm surprised no one else has thought to use a landscape orientation instead of the traditional portrait orientation that leaves a binder in the way for us lefties. The alternating grid and blank pages are working out ok, but I'd love it if I could fine this with lines on both sides of the page. The perforation and paper are quality - easy to detach notes from various meetings throughout the day and file them for future reference. Cool and quirky item with the Japanese instructions. 5.0 out of 5 starsGreat fountain pen paper! If you are looking for smooth writing paper for fountain pen writing then you have found it. Virtually bleed resistant and most minimal of ghosting of any paper I have ever used, then this is the one for you... Added pics of paper sample of the front and back of paper. 5.0 out of 5 starsPerfect notebook! High quality! I use these notebooks for school. I love that they work with markers that otherwise bleed a bit since the paper is thicker than others. I use the Tombow Dual Tip Markers regularly. As well as some extra fine pens. The graphs are smaller size which is perfect for me. Very sturdy notebook. It takes a lot to wear this down. Better quality than the 5 Star notebooks in both the binding and paper quality. This has graph lining on one side of the paper and blank page on the other side all the way through the notebook. I take a lot of picture notes in my classes so the horizontal format works really well for me. For exam study, I write with the binding on the left side and for daily notes, I use it with the binding at the top so I can easily see where units end and begin. I use the binding to store my retractible pen when I put the notebook away. I feel like a high class executive when I use this notebook. I suppose it's good practice while taking my business course! Haha! I'll be ordering again soon.